Omega X-33 Repair in Microgravity – I Already Have a Watch. 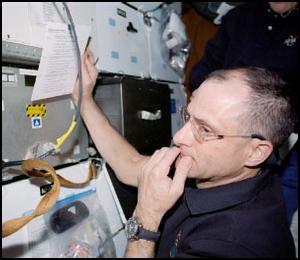 Astronaut Don Pettit repairs his Omega Speedmaster Professional X-33 aboard the International Space Station, Nov 2002-May 2003. This video was taken in orbit aboard the International Space Station by Astronaut Don Pettit during the Expedition 6 mission on the ISS, Nov. 23, 2002 to May 3, 2003. 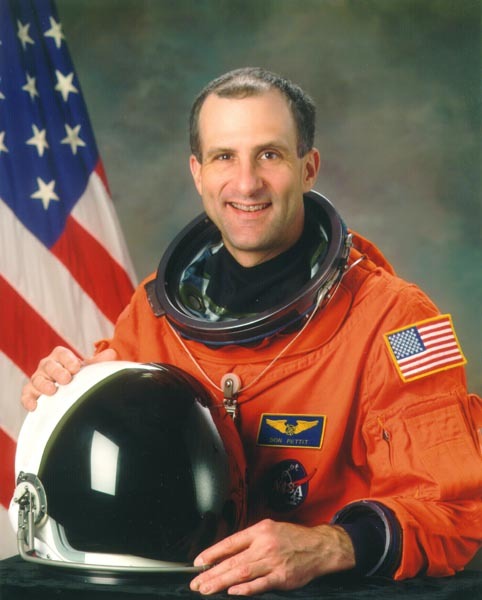 During the mission Pettit logged 161 days in space, including over 13 EVA hours during the 5-1/2 months aboard the ISS. He makes it look easy, as if it’s the sort of thing he does in zero-gravity all the time. And indeed, many earthbound watchmakers might be jealous of parts not dropping. Pettit’s X-33 is an interesting specimen. From the crown and caseback designs it appears to be a Gen 1 X-33, which would seem odd as the Gen 2 had already been released on the retail market more than a year previously. What almost appears to be a custom caseback design is probably only air bubbles trapped beneath a protective plastic backing. Petit’s bezel is especially unusual with its matte finish and light-colored (luminous?) numbers. Omega is previously known to have sent prototypes for real-world testing on missions. Perhaps this is such an experimental prototype design, though given Pettit’s considerable handiness with a screwdriver around watches and reputation for home-brew science it might well have been a custom self-modification as well. The particular faults Pettit repairs are the crown coming out and “Popping Pusher faults, described further in the problems chapter of my X-33 Article. It’s interesting to notice that despite the narration that indicates to the contrary it seems Dr. Pettit wasn’t able to successfully reinstall the crown. Apparently the cause of the crown failure is often a failed crown detent spring, the repair of which may have required a part that was of course unavailable. See the X-33 Article as well for more information about the Omega Speedmaster Professional X-33 and its use in space. Mailbag: Failing Omega X-33 LCD Display? Tagged with astronaut, nasa, Omega Watches, X-33. By the way, the above may look familiar to longtime readers as it was previously published on the old site, but while importing it seemed like it fit better as a blog post than a standalone article. Great posting of my Omega repair during Exp 6. You folks definitely know more about my NASA issued watch than I do. 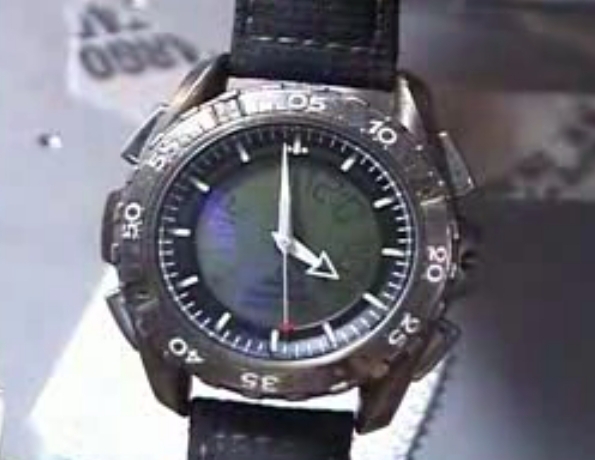 NASA issues us these watches during our training for flight. Then after landing we have to return our watches within a few weeks (some crews buy their own watch to fly so they can keep it). During Exp 6, we had three of these fail to the point where they were no longer useful. I took mine apart and fixed it (I forgot to make a video of the completed repair and the ending shot in the movie (shown here) was before I had put the back on- good job of catching that detail). I modified my Omega before flight to make the bezel numbers easier to read. I darkened the stainless ring and painted the numbers white which helps a lot particularly in low lighting. I use the bezel a lot for quickly setting an elapsed timer and wanted something easier to read in low light than the silver-black combination. I also anodized the gray Ti case a coffee color using an 18 volt DC current with dishwasher soap (sodium triphosphate) as an electrolite. I put a splash of blue and pink anodizing on the back case just because I could. After my flight, Omega came out with a improved version of this watch and it has not had any flight issues (the new version has an improved crown, the bezel turns both directions instead of only one, and the back is two pieces instead of one). I turned this watch in to NASA shortly after I landed and they returned it to Omega. I have no idea where it is now. Thanks to all the watch buffs for making interesting postings.